Not so much on the making front this week folks. Just mahoosive amounts of decluttering and mindful recycling. I can't go to the tip anymore because it upsets me too much. People throw so much stuff away and for a fixer like me, it is too much for my heart to bear. 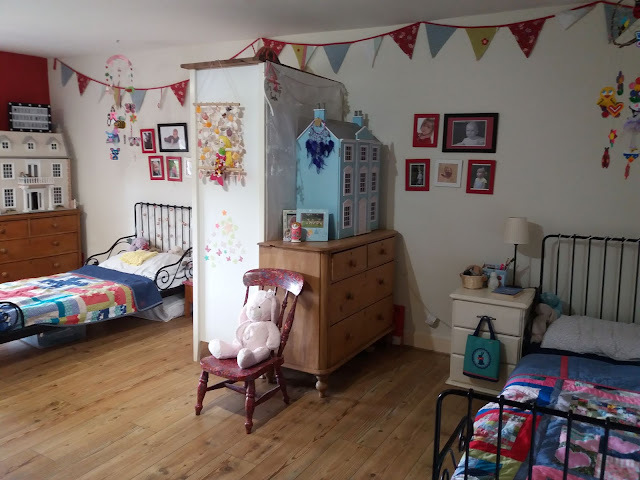 In this second week of the Summer holidays I promised the girls I would change around their room for them. There had been an escalation of bedtime bickering and I wanted to divide the room a little. This is what it looks like now. There was also a proviso for me in that they sorted out some of their stuff. It had got way out of control. 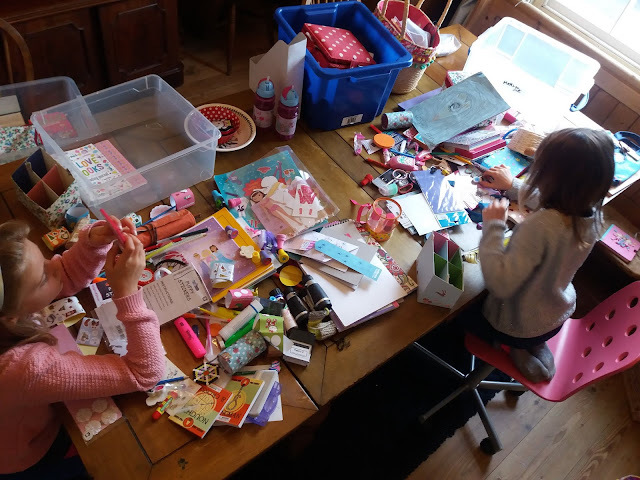 They could no longer keep their room in order because they just kept rearranging the clutter - there needed to be less of it. I went for the TV shock approach and asked them to put all their drawer and desk contents into plastic boxes and tip them out onto the dining room table. It worked. It was so overwhelming that they both wanted there to be less objects in their little lives. 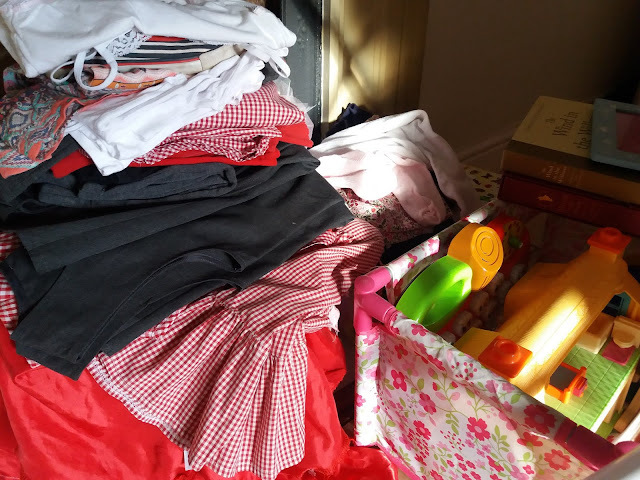 The children were asked to keep anything that would now fit into three drawers each. They did it with gusto egged on by milka chocolate breaks! Both girls had physically outgrown a vintage desk given to us nine years ago and Heidi had been asking for a space for her sewing machine since Christmas. By chance I spotted a desk in a house clearance shop which just needed a little TLC. 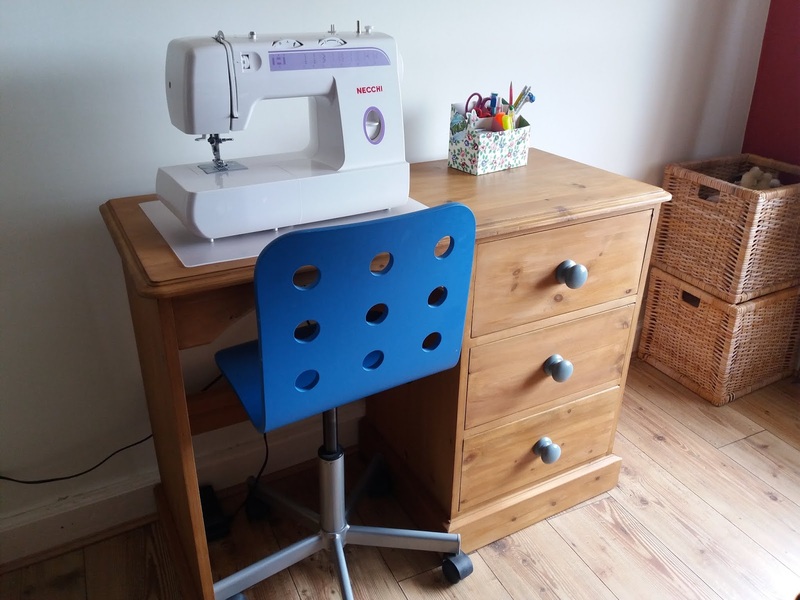 I struck a bargain of £30 if the guy delivered it, took away the old desk along with four infant sized chairs and a mirror which we had kicking around the house - all outgrown. He was delighted, I was delighted; I didn't have to go to the tip. Heidi enjoyed using the orbital sander to remove some marks and take down the colour a touch. She waxed it and I sprayed the knobs grey for her until we find some nice ceramic handles. Other desks were jiggled around too. I now have my machine on a marble washstand that stood in the hallway which is actually a bit bigger and Megan has my old smaller wash table as her desk. Outside of the girls bedroom declutter I have sold vinyl records: 2 Smiths albums were sold in a record shop for £30, I don't even have a turntable to play them on anymore! 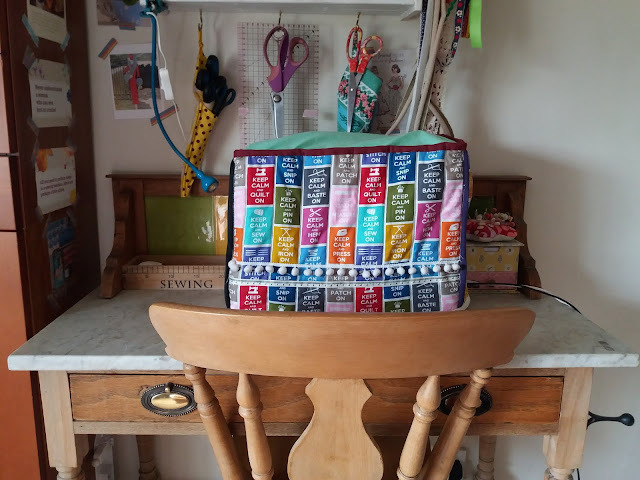 I have sold CD's, Books, weighed in textiles for recycling, given things to friends, taken bags to the charity shop, sold things on Ebay and I am happy that we only took three carrier bags to the bin. The house is breathing a huge sigh of relief. Much more to go but gosh it feels good. We have sorted dressing up that doesn't fit anymore and there are more toys and books from their toddler years to pack up. Heidi is starting secondary school in September and I have just payed an extortionate amount of money for her new school uniform. My little money pot, which got to just over £100 from recycling, has gone towards this. We have enough school uniform from Primary school to open a shop! This pile needs sorting into a few things to keep for Meg and other items for like minded second hand friends. Do you love a good sort out? You did great! I love to clear things out, it's one of my favorite feelings in life when things are gone and I can actually see more space created instead of stuff everywhere. I love the girls' room, it's pretty and looks nice and spacious. The new desk/sewing tables are fabulous, great repurposing. I use a child's desk as my desk, it's just big enough for what I need, but would love to be able to use my sewing machine on the desk. It's just a little too small for that, so I carry it to the kitchen table. Someday, though, I'm going to have a big, open work table where I can do everything. Just have to get some kids grown up and moved out first, so I can take over one of their rooms...I won't hold my breath just yet, ha. I've also been having a massive declutter! Your room makeover for girls is very pretty:) The sewing desk looks neat! I started decluttering two months ago, mostly involving paperwork, but got so busy with housework and health issues that it got slowed down again. It is an ongoing process and I am doing my bit everyday. Your daughters' room is lovely! I really like your sewing machine cover too. I love a good declutter. We recently did this in our spare room, which contains hundreds of books. It felt good. Unfortunately, my bloke is a bit of a hoarder and it is difficult to get unloved things out of the house... Annie just decided that she no longer wanted her high sleeper, which is now looking for a new home. 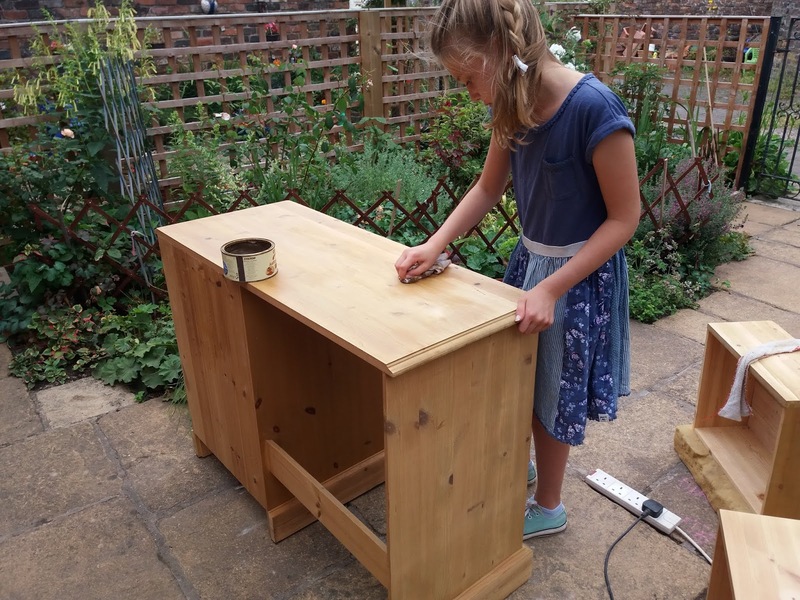 She got granny to buy her a new bed, has started painting her own room and is doing all herself. It is good but also a bit sad, I feel rather redundant! I don't like going to the tip either, I find it heartbreaking how much ends up in landfill that could still be used. You did an amazing job of the rearranging of the bedroom, a real bonus for each of them to have their own space. LOVE the washstand. I love a good sort out, Little B has had his dresser sorted with bigger boy themed shirts for school. He is still in the little boy mode but that won't do for first grade. Superheros are the thing even if he is still in Paw Patrol thoughts. I have gone through my closet again, still more to give away but two bags in two weeks helps. Love the divider int he girls room, my parents did this for my sister and I, it helped but she always had to walk though my part of the room to get to hers and it annoyed me.